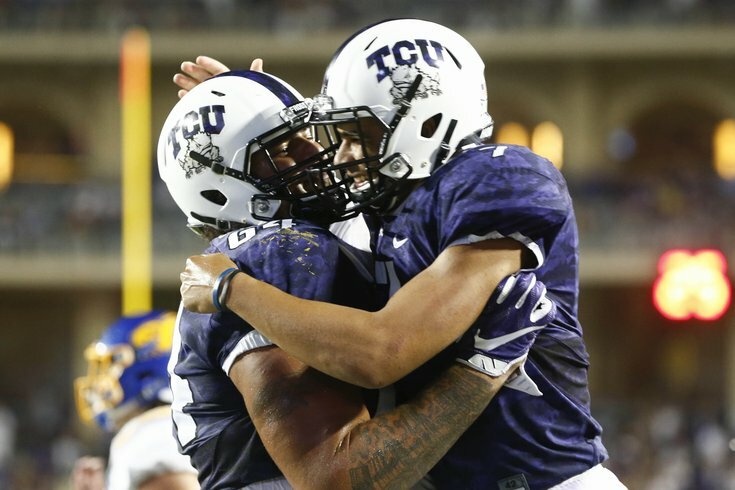 TCU Horned Frogs quarterback Kenny Hill (7) celebrates a touchdown with offensive lineman Matt Pryor (64). With the 206th pick of the 2018 NFL Draft, the Philadelphia Eagles selected Texas Christian offensive lineman Matt Pryor. Pryor is great big, long-armed blocker who falls in the category of prospect rather than project. His size and length traits along with his ability to play guard or tackle will offer immediate appeal as a potential third-day selection. He's better suited as a drive blocker who is allowed to work inside a smaller radius, but he's not a bad athlete in general. Pryor has dropped about twenty pounds since the end of the year which could help his case for staying at right tackle, but he's more than capable of playing guard if needed. The Eagles' roster is so stacked that offensive tackle is (rightfully) thought to be among their biggest needs, despite having arguably the best OT starting combo in the NFL, plus an improving 24 year old swing tackle with experience who could start on a bunch of teams. The starters, of course, are LT Jason Peters and RT Lane Johnson, and the young swing tackle capable of backing up either starter at LT or RT is Halapoulivaati Vaitai. At some point, the 36 year old Peters is going to retire, and when he does, the Eagles would be wise to have an extra offensive tackle in the pipeline, whether he be as an heir apparent to Peters, or simply as depth if the Eagles think that Vaitai can be a legitimate starter long-term in the NFL. Pryor offers some versatility, which Doug Pederson prioritizes. He can be a developmental prospect, both at tackle and guard. It's perhaps worth noting that Vaitai was a fifth round pick, also out of TCU, during the 2016 NFL Draft.